Agricultural Plastics: What are they? Why are they hard-to-recycle? Unless otherwise identified, these resources were developed by Lois Levitan, PhD, Cornell University Recycling Agricultural Plastics Program (RAPP). They can be freely accessed and used for educational purposes. Please acknowledge authorship. Asks and responds to questions, such as What are agricultural plastics?, What is plastic?, How is plastic film used on dairy farms and in horticulture? and what happens with agricultural plastics when they are no longer useful on the farm. Available as online Fact Sheet and also as a series of nine 8.5″x11″ posters. IDENTIFYING COMMON PLASTICS USED IN AGRICULTURE. January 2016. 2pp. pdf. Plastics recyclers are usually quite particular about the kinds of plastic (i.e., which plastic resins) they will accept for processing. Why? One reason is that the “recipes” for finished products call for the specific characteristics of certain plastics. It also depends on how the recycling plant is set-up to handle emissions – most plants are not set up to handle the toxic emissions from PVC. Limitations and capabilities of equipment are a factor, as is cost. It’s a plus for farmers and those involved with recycling programs to be able to differentiate among the common plastic resins used in agriculture so that sorting and separating can happen at the point of collection. 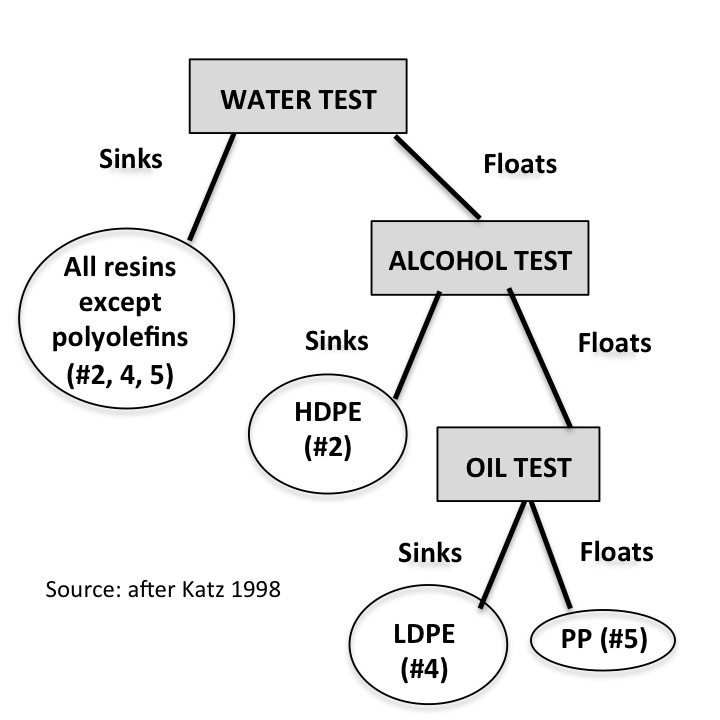 The paper describes and interprets sink-float and burn tests used to identify common plastic resins and describes characteristics of the resins such as density, feel, color, strength and stretchability. These tests and observations can be carried out—even in the field—with minimal supplies. Simple sink-float tests can be carried out in the field to identify the common plastics used in agriculture: Place a small sample of plastic flake or chips in a jar of water. Plastics that are less dense than water will float while more dense plastics sink. Polyethylenes and polypropylene are the only commonly used plastic resins that float in water. As its name suggests, low-density polyethylene (LDPE #4) is less dense than high-density polyethylene (HDPE #2). Thus HDPE chips sink in alcohol while both LDPE and polypropylene (PP #5) float. But LDPE can be differentiated from polypropylene – the least dense of the polyolefins – by putting samples in a jar of oil. The LDPE sinks while PP floats. USED AGRICULTURAL PLASTICS SORTED BY RESIN & TYPICAL LEVEL OF CONTAMINATION. Revised January 2016. 1-page graphic. Graphic shows agricultural plastics products – e.g., bale wrap, twine, irrigation pipe, drip tape, nursery pots, maple tubing, pesticide containers, feed bags, etc. – arrayed on a ‘graph’ by plastic r esin (X-axis) and typical level of contamination (Y-axis). In this context ‘contamination’ refers to anything other than the plastic resin, i.e., soil, vegetative debris, chemical residues, moisture, and/or grit. Placement on the ‘clean-dirty’ continuum is approximate and variable. Recyclability improves by following Best Management Practices so that plastic is kept relatively clean, dry, and free of grit and gravel. Resins shown are the four most commonly used in agricultural production: HDPE (high density polyethylene, #2), (L)LDPE (low/linear low density polyethylene, #4), PP (polypropylene, #5), and PS (polystyrene, #6). Linear low and low density PE are most common. AGRICULTURAL PLASTICS: WHAT ARE THEY? WHY ARE T HEY ‘HARD STUFF’? CAN THE CHALLENGES BE SURMOUNTED? Presentation given at the 2014 Plastics Recycling Conference illustrates the array of agricultural plastic products, the plastic resins they are made from, and qualities and practices that increase suitability for recycling. Farmers and organizers of agricultural plastics recycling programs—the people who supply used plastics to recycling markets—should be knowledgeable and clear about what products they have and which resin(s) the products are made from. This two-page FAQ includes a Table that lists agricultural plastic products alphabetically and identifies them by form (whether film, rigid or ‘other’), the resin typically used to make the product, and the usual color. RECYCLING AGRICULTURAL PLASTICS IN NEW YORK STATE. Lois Levitan and Ana Barros. March 2003 (2nd ed.) This report – compiled before there was any recycling of agricultural plastics in NYS or most anywhere else in the US – identifies (i) major uses of plastics on NYS farms, by agricultural sector and type of plastic resin; (ii) recycling technologies that are currently viable or that may be realistic in the near future; (iii) technical and infrastructural issues, as well as incentives and constraints to greater utilization of recycling technologies; and (iv) processes, agencies, and individuals involved in preparation and collection of materials. Useful as background, but most of the contact information is out-of-date.